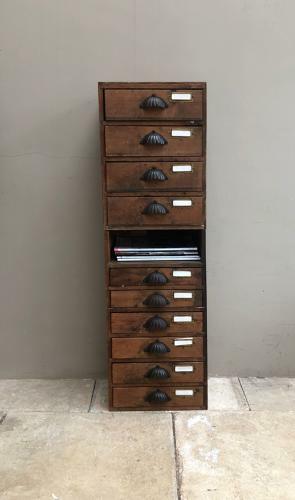 Early 20th Century Pine Flight of Ten Drawers with a great set of iron handles. These were used in a Workshop and were never made as a fine piece of furniture. Someone at some point has joined two sets together. There is one drawer missing between the two sets and this makes a great magazine shelf. You can see the join on each side and a little piece of beading would cover that...I am selling as I found. They have a great look to them and are very useful - great original colour. The top is ply as is the back...the rest is all solid pine. There has been some historic worm in the ply back but all long gone and been treated to make sure.